The Anti-Theft Case with Built-In Stand for iPad Air, iPad Air 2, and iPad 1st - 4th Generation from CTA Digital gives you peace of mind when using your iPad in school, the office or especially out in public. This interesting device allows you to secure your iPad to any immovable object preventing anyone from stealing it. It comes with a durable ABS case that is foam padded for even more iPad protection. The case also has a convenient built-in stand that is adjustable to any of eight positions for ease of viewing or typing. It also works in either portrait or landscape format. The included cable is made from a galvanized steel core and contains a PVC coating with a touch fastened strap for cable management. The lock head is a zinc alloy with nickel plated head. The combination of these items gives you total protection as well as flexibility of use when outside. Using the system is easy. 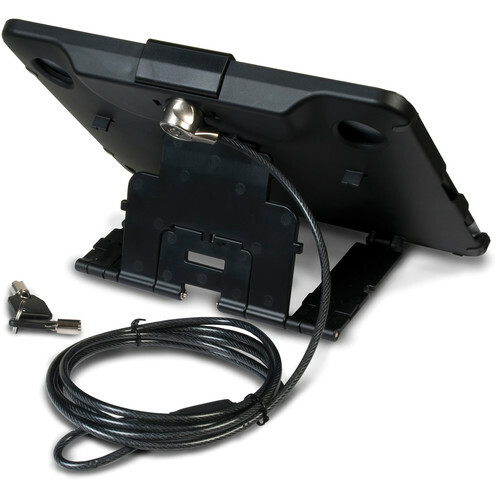 Your iPad fits in the case and locks together to the long 78" cable that can be secured around a column, fence or table leg. You now have the freedom to get up, walk around and leave your iPad knowing it will be there when you get back. When you're ready to leave, just unlock the cable with the included key, and you're ready to move on to your next destination where the whole process can be repeated. Box Dimensions (LxWxH) 11.2 x 8.2 x 1.7"
Anti-Theft Case with Built-In Stand for iPad Air, iPad Air 2, and iPad 1st - 4th Generation is rated 4.8 out of 5 by 4. Rated 5 out of 5 by Penrise from Easy to use, easy to carry We've been looking for an iPad stand to use at conferences, but they were all huge and heavy. This stand and lock works well - and has a sizer for an iPad Air. Its easy to carry, easy to fit, easy to lock. Highly recommended! Rated 5 out of 5 by Jussi2 from Great little case It's a good anti-theft case at a low price. You might want to go with something a little more heavy-duty if you need Fort Knox-level security, but if you just want to make sure nobody walks off with your iPad while you have your back turned, this is great. Rated 4 out of 5 by GhettoYi from Easy Setup Easy Setup and installation. Installed iPad Air into it with the available spacer, doesn't feel completely snug in there. The plastic doesn't feel like it'll survive a drop, but have yet to test that out yet, but for the cost, can't really complain. It's good enough for our mobile kiosk. Rated 5 out of 5 by Samuel from Solid and easy to use I'm very happy with this security case. It's rugged, easy to set up and easy to use. Good product!